A sunny room on an upper floor is prime real estate in the Bristol Place Assisted Living Facility, so when the cantankerous Abby is forced to share her quarters with new-arrival Marilyn, she has no choice but to get rid of the infuriatingly chipper woman by any means necessary. A seemingly harmless bet between the old women quickly escalates into a dangerous game of one-upmanship that reveals not just the tenacity of these worthy opponents, but also deeper truths that each would rather remain hidden. As heartfelt as it is deliciously inappropriate, this is a hilarious comedy. Here are some scenes from Ripcord. Watch it now. This video shows snippets from the first table reading of RIPCORD. Watch it now. 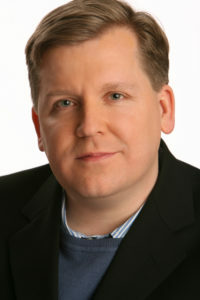 DAVID LINDSAY-ABAIRE is a Pulitzer Prize winning playwright, screenwriter, lyricist and librettist. His most recent play, Ripcord, opens September 15 for its regional premiere at the Waterfront South Theatre, Camden, NJ. This comedy is presented by South Camden Theatre Company under the direction of Dan Hickey. His previous play Good People premiered on Broadway, was awarded the New York Drama Critics Circle Award for Best Play, The Horton Foote Prize, The Edgerton Foundation New American Play Award, and two Tony nominations. His play Rabbit Hole received the Pulitzer Prize for Drama, five Tony nominations, and the Spirit of America Award. David also wrote the book and lyrics for Shrek the Musical, which was nominated for eight Tonys, four Oliviers, a Grammy, and earned David the Ed Kleban Award as America’s most promising musical theatre lyricist. David’s other plays include Fuddy Meers, Kimberly Akimbo, Wonder of the World and A Devil Inside, among others. In addition to his work in theatre, David’s screen credits include his film adaptation of Rabbit Hole, Dreamworks’ Rise of the Guardians, and the upcoming Family Fang, starring Nicole Kidman, Christopher Walken and Jason Bateman. The stars of this “rippingly funny” play are Virginia Barrie and Susan Dewey. Their supporting cast includes Frank Harbiger, Steve Harding, Elyse Emmerling, and Justin Prince-Moy.